Reinhardt University in Waleska, Ga., offers a beautiful setting that creates a wonderful ambience for your special event. Nestled in rolling hills and an arboretum of 1300 trees and plants, particular care is given to the landscape, the University's backdrop. 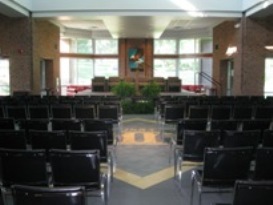 The W. Frank and Evelyn J. Gordy Center is the University's main dining and meeting facility. Since its opening in 1984, it has hosted numerous wedding receptions, civic dinners, sports banquets and other memorable gatherings. The main dining room is an area favorite for wedding receptions, reunions, group dinners and anniversary dinners.& The room can accommodate 250 guests for a sit down dinner with a buffet line and space for a disc jockey. Gordy Lecture Room, Gordy Seminar Room 1, and Gordy Seminar Room 2 (Coming Soon), SIMMS 1 and SIMMS 2. Two smaller meeting rooms are on the second floor. One accommodates 12-15 people and the other up to 40 people. No elevator access is available to the upper floor. No alcohol is permitted on the campus, and catering is available only through Metz Culinary Management in this building. 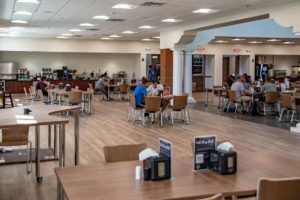 Metz Culinary Management, Reinhardt's food service company, serves three meals daily when classes are in session and is also a full service caterer. They have menus that are appropriate for all function types and sizes, including banquets, receptions, meeting breaks, box lunches and cookouts. The Fincher Visual Arts Center offers a central art gallery that can serve as a lovely venue for a semi-formal luncheon or dinner. Divided into two adjacent spaces, the larger one holds 60 people for a sit down dinner or more for a reception, and the smaller space can be utilized for a serving area. The Center's rear terrace boasts a beautiful view of Lake Mullenix and is a wonderful space for a more dressy but casual cookout. On-site food service is available from Metz Culinary Management and must be negotiated separately. 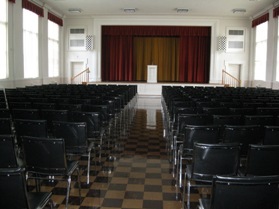 The Hoke O’Kelly Auditorium is located in the Burgess Administration Building and can accommodate up to 300 people for a lecture. 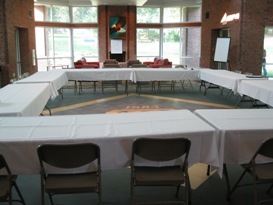 The room can also be set up for smaller meetings with tables and chairs. The latter arrangement allows plenty of room for break-out space and refreshments. Parties and dances are frequently held in this versatile venue as well. The Bannister Glasshouse is located on the lower level of The Hasty Student Life Center and is the hub of campus life. This venue features a dramatic two-story wall of windows facing the center of the campus and provides accommodations for activity and meeting space. Food Service is available from Metz and must be negotiated separately. We are conveniently located I-575 and I-75 in the rolling foothills of the North Georgia mountains.